ABELCET® is a sterile, pyrogen-free suspension for intravenous infusion. 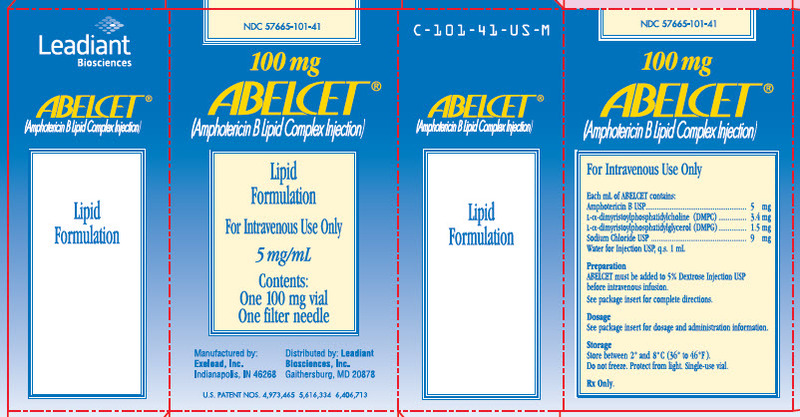 ABELCET® consists of amphotericin B complexed with two phospholipids in a 1:1 drug-to-lipid molar ratio. The two phospholipids, l-Î±-dimyristoylphosphatidylcholine (DMPC) and l-Î±-dimyristoylphosphatidylglycerol (DMPG), are present in a 7:3 molar ratio. ABELCET® is yellow and opaque in appearance, with a pH of 5 - 7. NOTE:â€ˆLiposomal encapsulation or incorporation in a lipid complex can substantially affect a drugâ€™s functional properties relative to those of the unencapsulated or nonlipid-associated drug. In addition, different liposomal or lipid-complexed products with a common active ingredient may vary from one another in the chemical composition and physical form of the lipid component. Such differences may affect functional properties of these drug products. Amphotericin B is a polyene, antifungal antibiotic produced from a strain of Streptomyces nodosus. Amphotericin B is designated chemically as [1R-(1R*, 3S*, 5R*, 6R*, 9R*, 11R*, 15S*, 16R*, 17R*, 18S*, 19E, 21E, 23E, 25E, 27E, 29E, 31E, 33R*, 35S*, 36R*, 37S*)]-33-[(3-Amino-3, 6-dideoxy- Î²-D-mannopyranosyl) oxy]-1,3,5,6,9,11,17,37-octahydroxy-15,16,18-trimethyl-13-oxo-14,39-dioxabicyclo[33.3.1] nonatriaconta-19, 21, 23, 25, 27, 29, 31-heptaene-36-carboxylic acid. ABELCET® shows in vitro activity against Aspergillus sp. (n=3) and Candida sp. (n=10), with MICs generally <1 Î¼g/mL. Depending upon the species and strain of Aspergillus and Candida tested, significant in vitro differences in susceptibility to amphotericin B have been reported (MICs ranging from 0.1 to >10 Î¼g/mL). 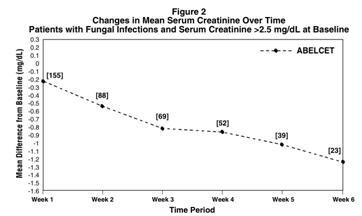 Pediatric and Elderly Patients: The pharmacokinetics and pharmacodynamics of pediatric patients (â‰¤16 years of age) and elderly patients (â‰¥65 years of age) have not been studied. Amphotericin B desoxycholate overdose has been reported to result in cardio-respiratory arrest. Fifteen patients have been reported to have received one or more doses of ABELCET® between 7-13 mg/kg. None of these patients had a serious acute reaction to ABELCET®. If an overdose is suspected, discontinue therapy, monitor the patientâ€™s clinical status, and administer supportive therapy as required. 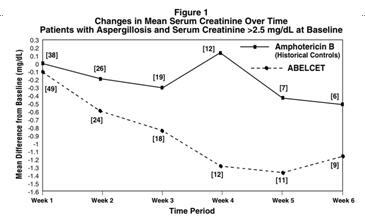 ABELCET® is not hemodialyzable.